This beautifully soft 100% silk scarf is 20x20 and has the colors of champagne, with lots of light mauve and pale yellow. A darker burgundy runs throughout the design as well as along the edge. The coordinating jeweled piece falls about 1.5" from the bail and is made up of a burgundy round bead followed by a pink champagne angel. The beads of the angel are fully-faceted and sparkle like crazy with movement. The accompanying earrings fall 1" from the loop and consist of a small round pearl bead, a burgundy round, and a faceted rondelle with various shades of a darker mauve. It ends with a silver seed for a touch more sparkle. 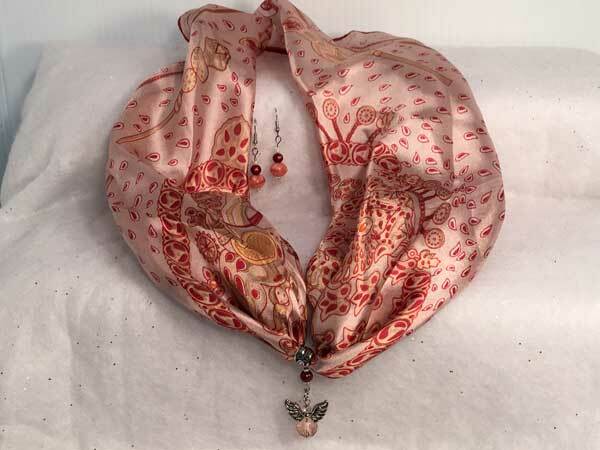 The set offers incredible variety as the jeweled piece can be easily removed and worn separately from the scarf. I have included 30+" of burgundy ribbon for that purpose, or place the piece on a favorite chain. So many options!